Fifa president Sepp Blatter has reportedly said it is "outrageous" he is being "condemned without there being any evidence for wrongdoing". It comes on the day that he was called "a hypocrite and a liar" by Chung Mong-joon, who plans to sue the Swiss for embezzlement and wants to succeed him at world football's governing body. Blatter is facing an investigation on suspicion of criminal mismanagement. "It's not an indictment," the 79-year-old told German magazine Bunte. Blatter, who will step down on 26 February, added: "This is just an investigation. I will fight until February - for myself, for Fifa. I am convinced that evil will come to light and good will prevail." Former Fifa vice-president Chung revealed this week he is under investigation by its ethics committee and said it had "sabotaged" his leadership campaign. 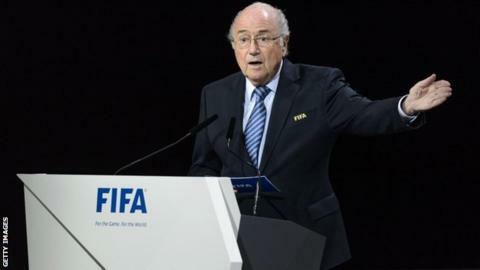 On Wednesday he told a Leaders in Sport convention in London: "Fifa has become a badge of shame. To call it a mafia is almost insulting to mafia, so blatant and arrogant is its corruption. "At Fifa, money and power have blinded Blatter in the virtues of sportsmanship. "I plan to sue Mr Blatter for embezzlement in court." The South Korean billionaire said he would launch his legal action through the Swiss courts and he is seeking US$100m (£65m). Why is Fifa in crisis? The Swiss attorney general's office said Blatter was suspected of signing a contract that was "unfavourable to Fifa" and making a "disloyal payment" to Uefa boss Michel Platini - the favourite to be voted in to replace him as president. Former France midfielder Platini denies any wrongdoing. Fifa's ethics committee is also investigating the matter. Blatter, who previously only spoke through his lawyers, confirmed to the German publication he will not step down early despite calls from Fifa's major sponsors. The Swiss has been in charge of Fifa since 1998. A separate Swiss investigation is also looking into the bidding process for the 2018 and 2022 World Cups in Russia and Qatar respectively. South African businessman and politician Tokyo Sexwale has told the BBC he could run for Fifa president - but has yet to make up his mind. Sexwale, who was imprisoned alongside Nelson Mandela during South Africa's Apartheid era, has been touted in recent weeks as a potential successor to Blatter. Now with the deadline for potential election candidates less than three weeks away he insists he will not rush to make a decision. "I haven't ruled anything in, I've not ruled anything out," he said. "I'm thinking. But what is thinking? It's consulting friends, it's talking to people." The 62-year-old added: "Leaders, and Mandela taught me this, must think very carefully. "Is it something I can do? Or is it something best done by others? There will be sufficient time. There's 20 more days to go." Read more - Fifa corruption crisis: Key questions answered.